And I Moved: Can it be 30 years? Can it be 30 years? No, not since I last posted to this blog. Although that's close. But it was thirty years ago that New York City saw the Son of Sam stalking couples in parked cars throughout the outer boroughs. It was thirty years ago that the great blackout of '77 hit the Big Apple. It was thirty years ago that a little-known Congressman named Ed Koch beat a field that included Mario Cuomo, Bella Abzug and incumbent Abe Beame to become mayor of the troubled city. And it was thirty years ago that the New York Yankees officially stole the title of the Bronx Zoo from their neighboring institution for an outrageous confluence of outsized personalities battling each other and the rest of baseball for a world championship. I was 12 going on 13 at the time, and it was a very memorable year. ESPN is reliving it all for me in a summer miniseries titled, The Bronx Is Burning, based on Jonathan Mahler's book [which I got a couple years ago but haven't finished] about the 1977 baseball season and all the other simultaneous events. It was in many ways a low point for New York City. Middle class families like mine had left places like Throggs Neck in the Bronx for more stable locales outside the city. The city was teetering on bankruptcy, without the resources to supply the necessary law enforcement presence to combat the increasing restlessness and disaffection among so many of its citizens. But through it all, the Yankees fought their way to a pennant and -- not to give away the ending -- a World Series title. The events of the ESPN series are from a time when I was most obsessed with baseball. In fact, as the first episode aired, I kept announcing what was about to happen, leading my forgiving but bemused partner to ask, "Why do you have to watch this? You know it all!" But, like an old episode of The Honeymooners, long ago memorized, the satisfaction is in knowing what's coming, watching it arrive, and then appreciating it all over again after it's gone. To be really honest, I have no idea how good the series really is. I am completely, hopelessly unobjective. 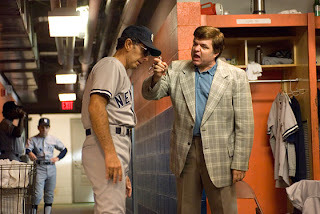 But it seems that John Turturro has studied and channeled the tortured Billy Martin. It seems that Oliver Platt has fully embraced the Midwest vowels and self-conscious bullying of George Steinbrenner. And the producers know just when to cut away to real footage, so we don't have to watch actors attempt to simulate the swing of Reggie Jackson or Thurman Munson. Even the show's theme music is of the period, some sort of brilliant reimagining of the themes from shows like Mannix or Kojak. It almost, dare I say it, sounds like a Mike Post theme. Maybe there's something fundamental, even elemental, about that age. As I said, I was on the brink of my teens. I remember it all clearly. When the blackout came, my parents wondered if something had happened at the Indian Point nuclear plant. The sky had an eerie glow and it was very quiet. I think that summer was when I first started to read a newspaper, fascinated by the hunt for the Son of Sam, who could have been outside our windows at night for all I knew, even though we were supposedly in a safe remove from the urban jungle in our recently purchased suburban home. It almost feels like ESPN created the series for me. And, to an extent, I suppose they did. Counting on there being enough like me, around my age, who could relate with the same kind of odd nostalgia to a time that was troubled, turbulent and transitional. A far cry from the Disney-dominated Times Square of today, or the corporately composed professionals of the current Yankee clubhouse -- both of which are probably preferable in the long run, but less romantic, to be sure. If you're still reading, it means you are a dedicated friend of this blog. Thanks for that. And do check out an episode of The Bronx is Burning, and let me know what you think. Whew, I got a post in during the month of July! Hope to be back more often in August. Glad you got your post in before it became August! Don't know where the summer has gone to. Before I know it, I'll be getting ready for Christmas. How's the new job going? You know me and my (healthy, as sometimes it’s not) nostalgia for the 70’s. I can’t say I know a lot about NYC though, especially the baseball, but what I do know came from Theo Kojak, Crocker, Dave Starsky and Ken Hutchinson. I was happy as Lowry on my sofa on Saturday night watching the New York cop shows and the irony was that the violence, albeit right overthrowing wrong, was how we distracted ourselves from the nonsense surrounding us in Nothern Ireland (nasally pronounced or sung ‘Norn Iron’ by locals). In retrospect it seemed to be everywhere in those times. Everyone on the verge of rebellion. It’s not that we needed punk as we were punk. It’s good to relive good memories though, but not as a benchmark to compare to a shittier now. That can be dangerous. All eras have their shite, and you have pointed that clearly here. I understand why you watch, even though you know what happens. I will look it up and have a looksee. I recorded it Chris. I haven’t been sleeping too good, I am always tired never asleep, so I’ll watch it on Thursday when I feel I can give it some time. But I recorded it on the day Barry Bonds broke the record – ironic eh? Something’s rotten in Denmark and I am not talking about the dope. MLB meets WWE. The most prolific slugger of our times, with Giants one out, and tying Nationals 4-4 at the bottom of the 5th, and they don’t walk him (but maybe I don't get baseball). And there are fireworks, and corporate boxes are full and memories of eight men out are supposedly just memories. p.s. did see Venus at the weekend. Marvelous. Hard to see anyone but O’Toole pulling that off, and it did seem as if he was writing/delivering some of his own epitaph. great show. platt is terrific. and the theme, as you say, just takes you back. i have the rest of the series scheduled to record. have a good weekend. cathy: Hi! The new job is dandy -- just the right thing at the right time for me. It's a kick to be able to make choices and decisions and see them in print in a tangible way. Feels like I am making some kind of a difference, and that's satisfying. Paul: My most loyal, intrepid blogger! God love your Irish self for recording my American baseball series and then actually watching it! Glad you enjoyed it. And, as for Venus, I did see it earlier this year [via a screener DVD from a friend who gets to vote for awards]. Truly a tricky job for Mr. O'Toole, imo, to portray this man. Some scenes were a little cringe-worthy, but I guess that was the film's point, no? And that bit about Shakespeare's sonnets is exactly how Mr. O'T. really feels -- I've heard him say he carries the sonnets with him when he travels, as some monks do the Psalms. I don't know that he recites them at matins, but he is almost that pious and reverent about them. In any event, quite an extraordinary performance for a septuagenarian, in spite of the pulls and tucks his poor mug has endured. Again, so glad you got some pleasure from Bronx. It is close to my heart.